The letter below has been sent to the Honorable Robert M. Gates (Secretary of Defense, 1000 Defense Pentagon, Washington, D.C. 20301-1000). Kavehfarrokh.com was first informed of this matter by the Pasargard Heritage Foudnation. This letter has been drafted to protest against the US Navy’s decision to rename the Persian Gulf by another historically and legally non-recognized name in its Official style guide . 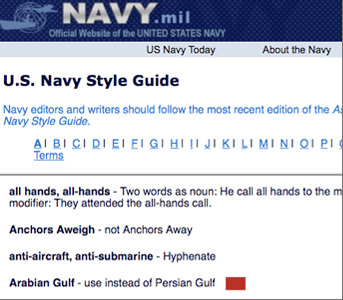 The “A” section of the US Navy Style Guide. Persian Gulf – use Ar…n Gulf. “Gulf” is acceptable in second reference. Note: The Arabian Sea is its own body of water and should not be confused with references to the Ar….n Gulf. Your decision is in direct violation of the directives and decisions of the United Nations. Kindly note the Editorial Directive (ST/CS/SER.A/29/Add.2) issued by the Office of the Secretariat of the United Nations on August 18, 1994 regarding UN Editorial Directive ST/CS-SER.A/29 – the scan of the original socument has been inserted in this document further below for your reference. Attention is one again drawn to Editoral Directive ST/CS-SER.A/29 and Corr.1 and Add.1 on the use of the term “Persian Gulf”. The purpose of the present addendum is to urge that care be taken to ensure the appropriate use of this term in documents, publications and statements prepared by the Secretariat. The full term “Persian Gulf” should be used in every case instead of the shorter term “Gulf” , including in repetitions of the term after its initial use in a text. May I humbly ask why the US Navy directive has chosen to violate the UN Secretariat? Put simply, your directive or “Action Note” is illegal in the strict international sense. If the staff of the US Navy are hoping to pander to the pan-Arabist nationalist sentiments of the local Arab sheikdoms of the Persian Gulf states for political expediancy, then the following facts must be highlighted. The term “Ar..Gulf” has no historical basis. There are simply no Greco-Roman references to the Persian Gulf by any other name. But even more importantly, Islamic and Arab historical sources also refer to the Persian Gulf by its proper name. Below is a map of the Persian Gulf which was published bt the government of Saudi Arabia in 1955. Saudi Arabian map of 1955 which displays the correct name of the Persian Gulf. Attempts to revise the name of the Persian Gulf are based on political motives. The only reference to “Ar.. Gulf” is found with respect to the Red Sea of antiquity (e.g see Herodotus’ “Histories”). Despite politicized attempts at re-writing history, the United Nations has twice recognized the legality of the term “Persian Gulf” (UNAD 311/March 5, 1971 and UNLA 45.8.2 (c) on August 10, 1984). It is significant that all Arab countries (including Iraq, Egypt and Abu Dhabi) have signed both of these documents. The reasoning of the United Nations is simple: current political issues cannot be mobilized to re-write history. Such methods are reminscent of the historical revisionism of the Communists of the former Soviet Union who often revised history books and terminology to service short-term economic and political goals. Medal issued by the US navy in 1992 – note the term “Persian Gulf” is clearly displayed. This was first reported by the Talkhnegar Blogspot. The decision of your US Navy Office to resort to historical revisionism suggests the implication of political and economic motives. I am however fully confident that your distinguished service will steer tiself away from what Russ Germain describes as “”geopolitical interests“. On these important notes, I humbly invite you to adhere to the guidelines established by the United Nations and the international community. Your attention to this matter is indeed appreciated. Head of Department of Traditions & Cultural History (استاد سنتها و تاریخ فرهنگی ازدانشکده دیپلماسی فرهنگی – انگلستان ) of the WAALM School of Cultural Diplomacy (WAALM-SCD) affiliated with the Academic Council On The United Nations System (ACUNS) and The International Peace Bureau. Use of Misleading Terminology for “Convenience”? New Military History Book by Ian Hughes: Stilicho – The Vandal who saved... Science Daily Report: Lost Civilization under the Persian Gulf?